Once upon a time savings bonds were easy to understand. Now they have some wrinkles that are important to understand to get the most out of owning them. As of today (7/16/2010) the federal government is issuing two kinds of savings bonds: Series EE and Series I. 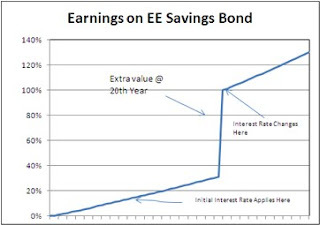 Today we’ll discuss the basics of the current version of the Series EE savings bond. Congress periodically fiddles with the savings bond rules, and the most recent big change was effective in 2005. Starting in May of that year, the interest rate on an EE savings bond is fixed for the next 20 years based on the rate in effect at its sale date. After 20 years the savings bond is considered “matured” but continues to earn interest at a rate that is set once the 20-year period has concluded based on then current rates. The initial rate for Series EE bonds is set twice a year, in May and November. The current rate for the first 20 years is 1.40% per annum, compounded semiannually. The biggest wrinkle occurs at the end of the 20th year. When the fixed interest rate is less than 3.5%, at the 20th anniversary the value of the savings bond is increased to exactly twice its purchase price. At the current level of interest rates this wrinkle provides a big increase in value. A microsecond before the 20th year is complete an EE savings bond bought today has increased a little over 32% in value. A fraction of a second later the increase changes to 100%. Talk about a wonky investment – don’t you wonder what Congress was smoking the day they decided this was a good idea? The EE bond has some other wrinkles if you want to cash it in early. You are not allowed to cash in the bond until a year has passed. If you cash the bond during years two through five, you lose the last three months of interest. Tax Advantages. The interest on Series EE bonds is not subject to state and local income taxes. For federal taxes, the interest can be deferred until the year the bond is cashed in or finally matures (30 years after its issue), whichever comes earlier. If you elect, you may pay income taxes on the interest as it is earned, but only if you make a special election and the election applies to all your savings bonds. If you paid for higher-education expenses in the same year you cash in the bond (and meet a bunch of requirements beyond the scope of this blog entry) you can altogether exclude the Series EE bond income from your federal income tax calculations. I’ll talk about the ways you can buy and redeem EE and I Bonds in a later post. I will also provide my thoughts about when the bonds might be good to include as part of your portfolio. First we need to cover the basics of the other savings bond. Next Up: Series I Savings Bonds.